I remember distinctly the first time I read Picnic at Hanging Rock. It was in year 10, Mrs. Griffiths' class. In my mind, she is an amalgam of all my favourite teachers at once. Each term we were required to read at least one book. Romeo and Juliet. Then something from a box of classics she had stored under her board- I chose Mansfield Park, my first Austen. Some other book that didn't stay with me. 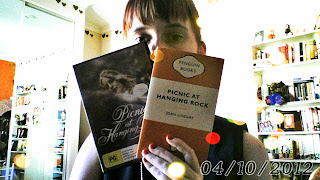 And in there, either second or third term, I don't remember- Picnic at Hanging Rock. Reading it that first time, I remember thinking that it was rather quaint and silly. The year is 1900. A group of girls set out from Appleyard College in Victoria to have a picnic at the Hanging Rock in Mount Macedon, accompanied by the lovely Mademoiselle du Poitiers and the acerbic Greta McCraw. Three senior girls, Irma Leopold (an heiress), Marion Quade (a mathematics whizz) and the ethereal Miranda go to measure the base of the rock, with detestable Edith Horton in tow. But while Edith returns, hysterical, none of the other three come back, and it transpires that Miss McCraw is also missing. Back then, I could not appreciate the subtle metaphors peppered throughout the novel- European watches being useless in the bush when they all stop; stockings and boots being removed and lost; the lasting image of the girl in white lost amongst the bushland trees. It frustrated me far too much that the mystery was not solved. But as I read the novel a second, and now a third time, I have realised that the solution was never the point of the novel, although there was one written and removed by the publisher. The point is the lines of fracture which radiate out from the incident, touching the lives of everyone who knew someone on that rock during that day. Lindsay's characters are well drawn, if not a little derivative of stereotypes (Albert and Michael in particular). Her depiction of the menacing Mrs. Appleyard with pompadour and cameo is reminiscent of the rock itself. It is a story of bushland Australia, and of the incongruousness of European attempts to dominate it. An unlimited number of possibilities to interpret this book exist and as a research student I am now learning to anticipate books such as this one with a childish glee. This work of Australian Gothic is a compulsary read for any Australian Literature enthusiast, and (at the risk of sounding like a broken record), an interesting reading companion to Jasper Jones. I give this book five out of five missing corsets. I'm pretty sure I've seen some kind of film adaptation of this book. I remember not liking it very much for the same reasons you didn't connect with the book the first time. Keeping what you've said in mind, I may attempt to read this book now instead. Hi Amber-Rose, yeah that's the film that I'm holding in the photograph. Watching that the first time you think... this is weird! But if you can allow yourself to be swept away into the period they are recreating, it's very entertaining. I watched it the other Wednesday when the weather was overcast, and it was spooky indeed. It was directed by Peter Weir in the 1970s and is credited with being one of the films which really started the Australian Film Industry back then, although we still experience a bit of a cultural cringe about our films to this day. Still, I liked that one. And the book is lovely.